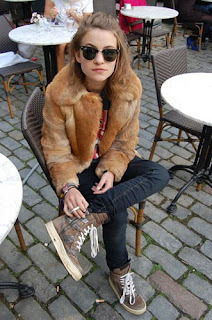 This post is basically on all the famous young people that have great style in my opinion. The first one is Coco Sumner, daughter of Sting. She is a musician herself, in a band called Blame it on Coco. I think she has very cool personal style. For me she kind of looks like a mix of Cory Kennedy and Alice Dellal. Miley Cyrus. Lots of people still see her as the fourteen year old Hannah Montana star, and I still can't believe how much her style has developed. These are a few recent candids from the past month or so and I think she looks amazing. I am absolutely in love with her hair and her legs! I mean she's only 5'4" (imdb.com) but her legs look kilometric. I personally don't like her looks in her concerts, but when she's just chilling she always wears such cute stuff. I am loving the very simple look with the stripy shirt and very skinny jeans, but in my opinion what makes the outfit are the clogs! I never really liked them until I saw them on her and how she was working them. I REALLY want a pair now. I love the really loose chemise/cardigan and those ankle boots, and by judging from other photos she loves them a little too much as well. The army button down is lovely. What I really like about her style is that she wears something really simples and then sparks it up with just one item and doesn't over do it. I am not a fan of those shoes though. I love everything about this outfit. The monochrome, the bracelet, THOSE CHRISTIAN LOUBOUTIN SHOES! Miley really knows how to choose her shoes! I love the pants, they really do look very good on her! I find this girl extremely pretty and I am so in love with her hair as well. I really like how this white dress contrasts with her tan skin. It gives out such a summery feeling. She really did grow up so much; only a few years ago she was still the adorable child from Uptown Girls. Now she's playing evil vampire roles and plays Cherie Currie from the Runways with Kristen Stewart. What I like about Dakota is the fact that she looks and acts her same age. I like Miley Cyrus' style, but I don't like how most times she tries to prove that she's not a young girl anymore. Dakota stays real to herself.